Greek Default Watch: How on Track is the Greek Bail-Out Program? As Greece is negotiating a second bail-out package, including perhaps a form of debt restructuring, it is worth asking, to what extent is Greece’s current program failing and in what ways? Recession has been deeper. The May 2010 agreement between the IMF/EC/ECB and the Greek government projected a GDP drop of 4% in 2010 followed by a contraction of 2.6% in 2011. In reality, GDP dropped by 4.5%, leading to a revised forecast for 2011 at -3%. So far, in Q1 2011, GDP has dropped by 4.8% year-on-year, which makes the revised 3% contraction for 2011 seem optimistic. Unemployment has been greater. In May 2010, unemployment was projected to hit 11.8% in 2010 and then keep rising to 14.8% in 2013 before starting to come down again slowly. In reality, unemployment hit 12.5% in 2010 with Q4 2010 unemployment topping 14.2%. The latest IMF forecasts, which put 2011 unemployment at 14.8% may prove, in retrospect, to be too optimistic. Inflation ended up much higher. In May 2010, inflation was forecast at just 1.9% in 2010 with end-of-year inflation having fallen to 1%. In reality, yearly inflation was a much higher 4.7% with the end-of-year number being 5.2%. In fact, nominal GDP fell by €6 billion as expected – but higher inflation meant the real GDP drop was higher. In part the nominal growth in prices came from higher taxation. But the Greek government has also suggested that the IMF under-estimated the micro-economic inhibitors that would prevent prices from falling. The current account fell as planned – at least based on some numbers. In May 2010, the current account was expected to improve from a deficit of €26.6 billion to a deficit of €19.3 billion. In reality, the initial 2009 deficit proven smaller, but the 2010 number ended up at €19.5 billion. However, that is the number quoted by the Hellenic Statistical Agency and Eurostat; the IMF and the Bank of Greece show a 2010 deficit of €24 billion (this is a discrepancy which I have yet to reconcile – and figuring this out has major implications on a bigger question, which is whether Greece’s exports are growing). Greece’s budget deficit shrank just below the target. This is a controversial statement but bear with me. In May 2010, the troika and the Greek government signed a document that said the budget deficit of 13.6% of GDP in 2009 would shrink to 8.1% of GDP in 2010 – a swing of 5.5 percentage points. In reality, the 2009 deficit was revised up to a (final) figure of 15.4%, so Greece had to come down from a higher base. The 2010 deficit ended up at 10.5% - meaning Greece achieved a correction of 4.9 percentage points versus a target of 5.5 points, which is more or less in line with the 10% deviation between the expected GDP contraction of 4% and the actual GDP contraction of 4.5%. However, the path to that fiscal end was different that what was expected at first with revenues performing worse and expenditure cuts performing better than expected (see here). And so far in 2011, the targets were just mildly off track in April (see here). Debt was higher than expected, but only due to a revision in historical numbers. In May 2010, debt over GDP was expected to grow from 115% in 2009 to 133% in 2010, a jump of 18 percentage points. In reality, historical debt over GDP was revised to 127.1% as unrecognized liabilities came into the budget. The debt level in 2010 ended up at 143% of GDP – a worsening of about 16 percentage points, which is less than initially forecast. The reason for that is that while the deficit proved slightly higher than expected, the GDP contraction was greater than the forecast, ending up with a deterioration in the debt level that was less than initially expected. Stepping back, therefore, it is clear that the macroeconomic assumptions of the program proved optimistic in forecasting GDP, unemployment and inflation. As a result, the budgetary and debt targets suffered, although the debt numbers improved slightly versus the forecast as a result of a weaker economy. It is hardly fair to say that the program is a failure, although the political will and cohesion to implement the program is sagging and so it may turn into a failure later. 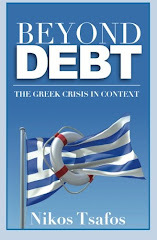 The program’s weakness lies not with its basic parameters but with its premise that Greece would return to the market to refinance its debt by early 2012. That failure reflects the difficulty of Greece’s initial condition, further complicated by the negative press the country has received; but it also emerges more generally from pessimistic about the Eurozone as a whole. The fact that other European countries are under the microscope makes Greece’s position more precarious and compounds the pressure under which the country has to operate. At the end, it is that pressure and market sentiment, more than a complete failure to meet targets, which lies at the heart of Greece’s need for further aid.